Set us straight with the kind of slider this is. This is not a Detroit slider, but rather, a gourmet slider. Do you recommend it? It's one of those things - what kind of slider are you in the mood for? 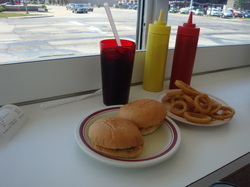 If you want the grease and more of that old-school environment, then go to Motz's. Can you give me the rundown on this place? 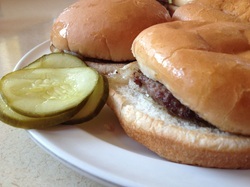 Green Dot Stables is really known for some fair-priced restaurant-style sliders and drinks. All of their sliders are $2-3, and they’ve got a ton to choose from. The burgers and all of the different sliders are pretty good. The burger meat seemed a bit dry on both of my visits. What's the history? It’s located in the Corktown neighborhood of Detroit, and it features an equestrian theme. In fact, our server told us that the building used to actually be a spot where horse race gambling took place. Now, Green Dot Stables has that full theme going, and even their TVs only air horse racing. Would you bring someone here? 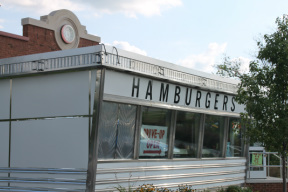 Yes, but it may not be the destination that everyone claims, especially if you're on the burger trail. The history and current theme and decor creates a really cool vibe. It's a cool place with a cool overall theme. They also have a location in Lansing. Finally? They’ve got a rotating mystery meat slider option that’s pretty popular and is always a definite conversation piece. Does this place stack up to a traditional Detroit slider? Yes! This place falls right in line with what we look for in a slider. What about the Ann Arbor location is so unique? Well, it's in a perfect place for post bar activities. With the location being in the middle of all the night life, it's easy to use these greasy burgers to soak up all your fun. What's the ambiance like? It's a slider joint with a street view. If available, these seats not only have auto traffic, but everything else a great place like downtown Ann Arbor has to offer. How's the beef? Their meat comes straight from Detroit. Their meat comes straight from Detroit. Smacked and topped with caramelized onions. Decor? There are pictures of Detroit landmarks, sports and beyond, and there’s even a set of seats from the old Tiger Stadium. When you walk in, you also notice the connection to the original Birmingham location through photos and memorabilia. Nice touch. Anything else? 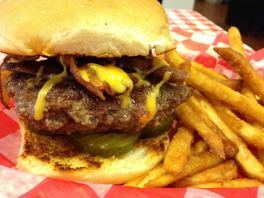 Check out the full review on file to understand how important this place is to Michigan burger lore. ​Does this place stack up to a traditional Detroit slider? Yes! It's a porcelain palace with stainless steel tops. 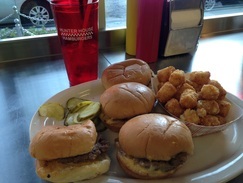 The sliders are meant to saturate your brown bag, so get 'em to go! How's the parking? Good if you're lucky, don't have a big car, and go in the correct way. Who goes here? Only the slider loving population. The generation that loves a greasy hamburger with caramelized onions. If you go on an important game day, you will be sure to see the passion of the sports community. Would you bring your dad here? He told us about this place. It's a classic! Anything else? Bates’ Hamburgers only takes cash, so be prepared. Also, no bathrooms, so that’s another thing to be prepared for (but once again, slider joints are not “hang-outs”). Does this place stack up to a traditional Detroit slider? Yes! I’ve been going here for years with my dad. We sit at the same table (if available) each time and always get great service. How many sliders to order? Back in the day I could go for 4, maybe 5 in one visit. Now I take it easy with 3, but my dad keeps it light as he only orders 2 these days. What's the decor like? It's a fifties style slider joint and provides great service. They even have a drive thru for those of us that are in a hurry. Let Buster the donkey welcome you in. What do you wish they had? Onion rings. Anything else? Back in the late summer of 2012 Bray’s made the news, not for their slider, but for some sort of federal investigation. Does this place stack up to a traditional Detroit slider? Yeaaahss, it does. I suppose that it does with it's unique stainless steel frame. The burgers are okay. I'm still hung up on the burger Vinnie served. How many sliders to order? I order 2-3 singles, unless I feel like I should order 2 doubles with cheese. Dressed? Yes, if you like the classic mustard/ketchup mixture, otherwise you have to apply everything on your own. What about their shakes? My daughter will request to go here for her birthday dinner every year just because their shakes rock. Anything else? Watch as they smack down fresh ground beef on the grill top. The crazy light up boom box belting out classic rock. 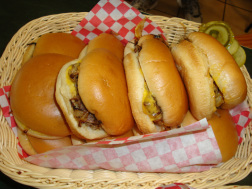 In a short time you will have your order and the sliders will melt in your mouth. 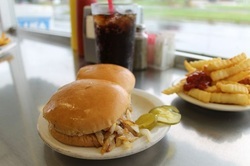 ​Does this place stack up to a traditional Detroit slider? Yes! So good, so good! How many sliders to order? Get 'em by the dozen! Best value and you'll want to eat all of them. Onion rings? Yes you need to order these onion rings. Just imaging large, fresh onion rings battered with a fair amount of cooking oil from the fryer. It takes some work to eat one, but it's well worth it. Do I want to go there right now? Yes! How's the reheat-ability of the food? Great! Kevin's brother can verify these claims. Anything else? The Michigan Burger Boys highly recommend this place for the slider enthusiast. ​Does this place stack up to a traditional Detroit slider? Sure does! They have a walk up take out window ready for your order. How's the beef? I wish they would give you more. Just a little at least. Maybe even lay off the seasoning. How many sliders to order? You aren't serious unless you get a sack of 'em. How are these sliders important to your youth? I remember waiting in the car with a plastic bag so I could prevent the brown sack of sliders from letting grease get all over the car interior. Anything else? Visit the CVS or Walgreens next door for some antacids. The reviews found on michiganburgerboys.com are truthful and honest opinions, not advertisements. The reviewers are not obligated or encouraged in any way to only provide positive reviews. Opinions found on this site are those of the individual reviewers and do not necessarily represent the opinions of others. The reviewers of this site are not paid for their reviews and are not otherwise employed by companies that provide burgers to the public.